Summer is officially in swing, making this the perfect time of year to take in all that the Pacific Northwest has to offer—mixed to the soundtrack of jazz, swing, blues, and more. Here are seven alfresco opportunities around Seattle for outdoors enthusiasts and jazz fans alike. 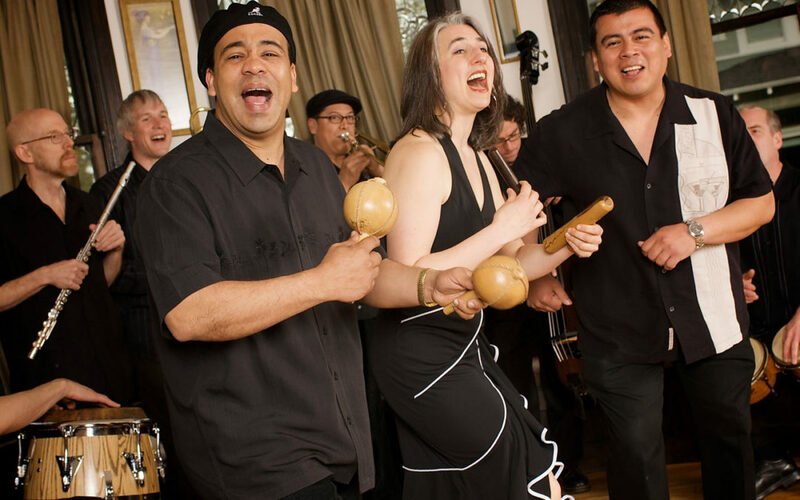 This summer the Art of Jazz Series at the Seattle Art Museum’s Olympic Sculpture Park continues August 9 with Orchestra Zarabanda, delivering hot Cuban salsa perfect for a Seattle summer evening. The Art of Jazz series is sponsored by KNKX 88.5 & Earshot Jazz and is part of the Summer at SAM events schedule. Concerts begin at 6pm. Admission is free. Details at earshot.org. Now in its fourth year, the Cornish@Amazon concert series in South Lake Union features a diverse selection of music played by Cornish students, faculty, and alumni. From Latin to contemporary jazz, there’s something new every Thursday from June 21 to October 4. Upcoming shows include: August 2, the Johnaye Kendrick Quartet, featuring the jazz vocalist and educator performing original compositions and fresh interpretations of jazz and blues classics alongside Bill Anschell (piano), Chris Symer (bass), and D’Vonne Lewis (drums); August 9, SassyBlack, aka Catherine Harris-White, a vocalist, songwriter, and producer with roots in classical and jazz; and August 23, the Joel Bean Trio with Joel Bean (piano), Paul Gabrielson (bass), and Will Lone (drums); and September 27, the Jovino Santos Neto Quarteto: Jovino SantosNeto (piano, flute, and melodica), Chuck Deardorf (bass), Mark Ivester (drums), and Jeff Busch (percussion). Full schedule available at cornish.edu/calendar. Formerly known as the Out to Lunch concert series, Downtown Summer Sounds brings free local music to downtown Seattle throughout the summer. Produced by the Downtown Seattle Association and presented by Virginia Mason, this series, which kicked off last month and runs through August 31, continues a 40-year tradition of supporting free live music for Seattle workers, residents, and visitors. This year, the Pike Place MarketFront joins the roster of venues, which also includes Westlake Park, Occidental Square, Harbor Steps, City Hall Plaza, and more. The series presents local favorites such as Seattle Women’s Jazz Orchestra (August 9, City Hall Plaza, 12pm), and En Canto (August 13, Day One Playfield, 4:30pm). Full schedule of acts is available at downtownseattle.org. Enjoy dancing outdoors in Seattle parks this summer as part of the Dancing til Dusk series, presenting 14 evenings of free music, dance lessons, and dancing. The series, now in its 12th year, kicked off las month. Upcoming shows feature: West Coast swing with DJ Joichi Tsunoda (August 7, Westlake Park); blues, soul, and funk with Lady A Band (August 9, Freeway Park); gypsy jazz swing by Ranger & the Re-Arrangers (August 16, Freeway Park); Swingin’ in the Rain with Dina Blade (August 21, Westlake Park), and many more acts. Dancing begins at 6pm, with a free lesson during the first hour. Full schedule information is available at danceforjoy.biz. This long-running series on the grounds of the beautiful botanical gardens and bustling Ballard Locks features an eclectic mix of performances ranging from big band and blues to Brazilian samba and Latin-funk fusion in this jam-packed summer. Happening every Saturday and Sunday at 2pm in July and August, all shows are free to the public. The 2018 series includes: Pacific Cascade Big Band jazz music from the swing era, August 4; Batucada, Brazilian samba, August 11; Mach One Jazz Orchestra, August 12; and many more acts. Full lineup at ballardlocks.org. A Seattle summer tradition celebrating more than 30 years, BECU ZooTunes, presented by Carter Subaru, at Woodland Park Zoo features today’s top stars in jazz, R&B, folk, soul, blues, and more amongst a beautiful outdoor backdrop. Rain or shine concert presentations include concessions and beer gardens, but not regular zoo admission. Proceeds from ZooTunes fund world-class animal care, conservation projects, and educational programs. This summer features Pink Martini, August 22 & 23, and Trombone Shorty and Orleans Avenue with Galactic, Preservation Hall Jazz Band, and New Breed Brass Band, September 9. Ticket prices vary and are available online, along with full schedule and more information, at zoo.org/zootunes.